Tagbilaran – The term Boholano refers to both the people of the island of Bohol and their language. Bohol is located in the Central Visayas region and is the 10th largest island in the Philippine archipelago. On March 15, 1565 the Basque-Spanish Miguel Lopez de Legazpi initiated a blood compact with two of the island’s leaders of Bohol, Datu Sikatuna and Datu Sigala to seal the friendship between the two parties. The natives adopted Christianity through the influence of the Spaniards. Today, approximately 96% percent of Boholanos are Catholic. In 2015, the Boholano population numbered 1,313,560, making Bohol the third fastest growing province in the Central Visayas region. They speak Boholano, categorized by many linguists as a dialect of Cebuano, even though the two languages have significant phonetic distinctions. An obvious disparity between the two languages is the way “y” and “k” are spoken. In Boholano, “y” sounds like “j,” while “k” sounds like “h.” Many locals also speak English, Tagalog, and standard Cebuano. Bohol natives are said to be descendants of the last group of inhabitants who settled in the Philippines called Pintados, who are characterized by the heavy use of tattoos as a symbol of status, beauty, and pride. 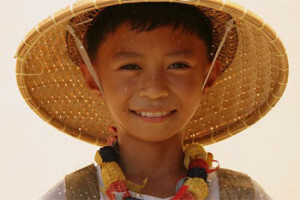 Even before the arrival of the Spaniards, Boholanos were already believed to have been trading with other civilizations. Artifacts discovered in places like Tagbilaran, Mansasa, Panglao, and Dauis indicated that the locals already possessed a culture three hundred years before the Spanish arrived. Stone tools used during the Paleolithic and late Neolithic Ages, as well as porcelain with designs prevalent during the Ming dynasty were just some of the identified relics excavated in the area. Two important rebellions recorded in Bohol during the Spanish administration included an uprising led by a babaylan (shaman) named Tamblot and the Dagohoy Rebellion led by the devout Catholic Francisco Dagohoy. Tamblot headed an uprising lasting from 1621 to 1622 to oppose the new religion being spread by the Spaniards and to urge people not to convert to the Catholic faith. Along with 2,000 Boholanos, Tamblot was eventually overpowered in a critical battle. Another fearless native who fought against Spanish oppression was Francisco Dagohoy. After his brother was denied a Christian burial by the Jesuit priests, Dagohoy urged his fellow natives to raise arms against the oppressors. The rebellion he started persisted for 85 years and endured many Spanish Governor Generals and several operations. Among the most prominent persons hailing from Bohol is Carlos P. Garcia, born on November 4, 1896 in the municipality of Talibon. He is the fourth President of the Republic of the Philippines (1953–1957) after President Magsaysay was killed in an airplane incident. Garcia was recognized for his “Filipino First” policy that promoted Filipino businessmen and businesses over foreign investors. Bohol was once part of the province of Cebu and became a separate region in the 19th century through a Spanish royal decree. Today, the island is famous for the Chocolate Hills, a geological formation of more than a thousand oval-shaped limestone hills. Bohol is also known as sanctuary for the world’s smallest primate, the tarsier. Additionally, it is popular for its large number of old churches with carvings and frescoes that date back to the early years of the Spanish colonization of the island. Although many of them were damaged during a major earthquake in 2013, preservation groups are now slowly restoring the ruined structures. Body art, such as tattooing, is common among Austronesian peoples, including the Filipinos. It was generally practiced in pre-colonial Philippines, particularly in the islands of Cebu, Leyte, and Bohol in the Visayas, as well as in the highland tribes of Northern Luzon. The Spaniards originally named the Visayas Islands as Islas de los Pintados or “The Islands of the Painted Ones,” since the people they first met when they arrived were covered with tattoos. Ancient Visayans whose bodies were marked from head to toe were called pintados or “tattooed men.” In Visayan, the general term for tattoos is batuk, which also meant the markings of snakes or lizards. These markings symbolize male valor and are painted on warriors as a declaration of bravery and strength. Warriors with more tattoos are more esteemed in society. Batuk was applied by pricking the skin in the desired pattern with sharp pieces of iron and then rubbing a black powder on the open wounds.